This is the easiest and the BEST BBQ ribs recipe - all from scratch. 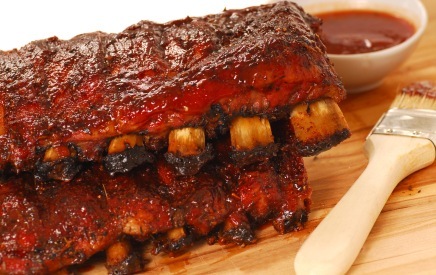 Many homemade bbq sauce recipes to create an "Oh My God This is SO GOOD" pork ribs recipe. Okay, here's instructions to the best homemade barbecue ribs you'll ever taste. It's so simple. Other than the homemade BBQ sauce, use your favorite (mine is Sweet Baby Ray's Honey Barbecue Sauce with several drops of Franks Hot Sauce). Place the ribs in a large pot and cover with water. Add the remaining ingredients and bring to a boil. Let simmer slowly for 2 hours. Do not let them cook too much - you do NOT want the meat falling off the bone just yet. Remove ribs from pan. Bring out a roasting pan or 9x13 inch pan and spray with oil. Add 1/2 cup of the boiling liquid to the bottom of the pan. I usually will add some barbecue sauce to the bottom also. Add the ribs. Sprinkle the ribs with 1/2 tsp garlic and onion powder. Cover with your favorite barbecue sauce and place in a 400 degree oven for 15 to 30 minutes. The sauce will be stuck more to the ribs, you don't want it sloppy wet with sauce. When cooking the ribs, you are layering flavor. The water is seasoned and then the ribs are sprinkled again with garlic and onion powder. Instead of baking the oven, you can also place them on the grill. Great either way. Here's a great tip: The key to a successfully cooked ribs is taking the back membrane off each rib. Now on to another one of my best bbq ribs recipe. Mix the homemade barbecue sauce together and store in the refrigerator overnight. NOTE: This dry rub works well with chicken, fish or any grilled food. Combine the dry rub ingredients in a large resealable bag and add the ribs; tossing to cover completely. Reseal and chill overnight in the refrigerator. The next day, you bring the meat out of the refrigerator at least 30 minutes before you grill it. Cook the ribs "low and slow," and baste with the barbecue sauce. The pork is done when tender and almost falling apart. The following is another variation of another one of my best bbq ribs recipe. They are spicy, (but not hot) sweet and tangy. Cooking "low and slow" produce succulent, falling-off-the-bone ribs. Instead of boiling them first, you can use the dry rub recipe above and chill in the fridge overnight before cooking them. Boil the ribs slowly for two hours. Oven: PREHEAT to 300 degrees. (Roast whole rack for 3-4 hours, then place on the grill and baste with more barbecue sauce) The ribs are ready when you pick them up in the middle and they droop down at the ends and the meat by the tongs just starts to develop small cracks. Mix the barbecue paste ingredients together and pour over the ribs; tossing to coat completely. Cook according to above directions.